I started a journal in the 1960s when I became a liberated young woman, and never stopped writing. Just became an old liberated woman. How did you get into this area of expertise? It all started in my living room in Detroit Michigan, where I sang and danced my way through every Broadway show tune. When I was 12, I led a dance class in my basement for kids in the neighborhood. After other careers and raising children, I taught in a preschool, started a music program there, branched out on my own, and—without any life plan or goal—Music For Little Folks was created. I became a clinician and performer traveling around the Midwest. I was always researching to perfect my craft. I am blessed for the passion and love of what I do. How did the idea for The More We Get Together come about? 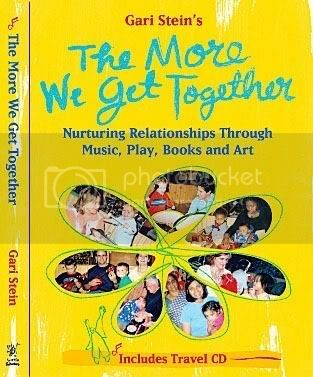 After creating a curriculum that I produced first on cassette and then CD along with guides and a DVD, I felt that if I was ever going to get on Oprah, I needed a book. The idea came about on the beach, where I always get inspired. I wanted something that educators and families could use.With grandparents, who passed on the music and the stories at the kitchen table or on the front porch, now often living far from their families; I was concerned that a generation was missing out on the richness of traditional folk music; reading and enjoying the arts together. Now, with these challenging times, I feel my book is a tool to help families find ways to be together simply, with little cost and stay connected. My favorite part was when I said, “Enough,” and sent it to my editor. I have put 20 years of work into the book and it is very gratifying to know that my ideas will help folks with their programs in the classroom and family time at home. My greatest challenge was not having a heart attack. Staying on task and writing everyday took its toll. There were times I would lie down on the floor and tell myself, “You can do it. Just eat 3 chocolate cookies and get back to work”. Trying to keep the educator and the parenting piece together, yet separate, was another ongoing challenge. What different elements are incorporated into the book? How did you decide what to include? I pretty much decided what to include before I started writing. I had a vision that stayed with me from the beginning to the end, although originally the focus was music. Once into my writing, I saw I wanted to include the play, books, and art piece. I included what was important to me as educator and a grandmother. In our hurry-up, dot-com world, children are not outside playing. There is plenty of time for computers after first grade. We are rushing childhood, and the media is telling us what we need to make children smarter. From my workshops and performing I could see what worked and what people were really looking for. The elements of research, personal stories from my families, and activities were important parts of the project. The parenting piece was an important element that I wanted to address throughout the book, while addressing the educator’s needs. My editor was very wise, when she suggested dividing it in two sections. I always wanted a lot of photographs and it all worked. How important is music education for children, as well as adults? Keep on keeping on. If anyone had told me that I would be a published author … it still makes me laugh. If you love to write, write. If it’s a chore, find another line of work. If, as a writer, you can give one person a smile, some help, or whatever it is—you have to contribute to make this world a better place—then it’s all worth it. We all can make a difference in our own little way, with our own little greatness. Share your words, your thoughts, your feelings. It’s what makes you who you are, what you are, and why. Be true to yourself, you are all you have. And the world is waiting to hear from you. There is no way to describe the experience of having the cartons delivered, opening your book, and smelling your words. Go for it!!!!! I wish I knew how hard rejection would be, but that is doesn’t matter. And that someday someone will say, “Yes.” Even if that someone was me. I also wish I knew how great I would feel when it was done. 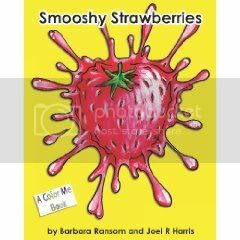 Author Q&A: Barbara Ransom and Joel Harris, "Smooshy Strawberries"
Jen's Gems ... For the Healthy Writer: Just StandAuthor Q&A: Sarah Happel, "Modelogues"